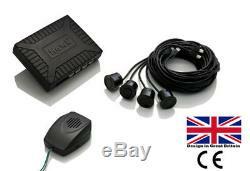 Parking Rear Sensors Kit 4 Sensor Kit- OEM Speaker British Brand. Will post to: Europe Item Location: London, United Kingdom Our Promise to You. NOW WITH CUSTOM DSP CHIP WITH SPEAKER FOR O. (Splice connector included free of charge). You are purchasing brand new Genuine Retail boxed HAWK Reversing Angel Direct from Largest O. The Production Has CE Certification. If Any Electronic Device Without'CE' Approval Is Installed On Your Vehicle. To see user & install manual search for hawkcaralarm under Google. HAWK Parking sensors kit are manufactures to original equipments standards with easy to follow fitting instruction; not cheap Chinese import. The speaker can be fix any where in the car. The warning buzzer sound in difference frequency according to different distances. The pleasant convenience brought to you by this radar system will deeply impress you especially in bad weather or at night. Enjoy your easy driving now! Supplied with easy to fit instructions- YOU CAN EASILY FIT IT YOURSELF there are two wires to be connected from the main control unit to your car rear lights and the rest is marked to plug and go (black wires goes to vehicle earth negative & red wire goes to reversing light on). Our sensors especially designed for easy spray painting to match your vehicle colour. Other sellers sell different coloured sensors, which do not match original vehicle colour. You will still have to re-spray to match the original vehicle colour. Kit includes:- 4 Ultrasonic sensor heads- to be fitted on the rear bumper of your car (sensor colour is black) can be easily spray painted. Ultra small control - to be placed in the boot of your car. Drill bit for accurately drilling the exact size hole in the rear bumper to recess the sensors. British English user's manual with installation guide. All leads and Drill bit supplied. With 20 years experience in vehicle security our technical knowledge and assistance is second to none. HAWK car alarm technology gives you peace of mind through affordable, advanced security systems designed specifically for motor vehicles and motorcycles. We believe that reliable, sophisticated protection should be accessible to all vehicle owners. The HAWK group has over thirty years' experience in the design and development of vehicle & motorcycle security system. A research and design led organisation, with the strength and depth of a skilled team enables the group to provide effective responses to market developments demanded in a rapidly evolving industry. HAWK Car Alarm has invested heavily in the most advanced computer aided design and automotive test equipment. The HAWK car alarms operates a total quality programme throughout the organisation. As part of its commitment to Total Quality, checks are undertaken at every stage of the manufacturing process. Test laboratories are fully equipped to perform EMC, vibration and climatic testing. Established quality measures ensure the group can offer its customers and end users the highest levels of quality and reliability. HAWK Car Alarm is proud to provide products approved to standards of CE, E-mark, Thatcham, EMC, FCC and UL. All PCB's are 100% inspected and tested by ICT testers. Naturally, all employees are trained to productively problem-solve to meet HAWK Car Alarm's objective of ZERO DEFECTS. HAWK Car Alarm's extensive knowledge regarding custom fabrication hasn't gone unnoticed. We are routinely called upon to work alongside other companies on many cutting edge designs and projects. Armed with most advanced professional hardware and software (CAD, PRO-E, PRO-TEL, in-circuit emulator, static electricity tester, etc), this elite group of talent is always ready to answer and satisfy customer's request for OEM and ODM projects. This is, in fact, the goal its entire staff is striving for. We also accept Postal Orders and Personal Cheque (may take 7-8 days to clear). You can either log in or just pay using a credit or debit card if you dont have an account. We are NOT for lost goods where you have supplied us with a wrong or undeliverable address. Packaging We take great care in packaging every item securely so that they arrive safe and sound to your doorstep. So we can answer your technical questions much quicker. Sometime technical questions much more complex. We got fully staffed technical dept. To answer your technical questions. Your satisfaction is our No. Add my Shop to your Favourites to receive newsletters about new items & special promotions! Vat number: 167638470, company registered in england & wales. The item "Reverse Rear Parking Sensor Kit 4 Sensors with OEM Speaker British Brand UK" is in sale since Tuesday, November 28, 2017. This item is in the category "Vehicle Parts & Accessories\In-Car Technology, GPS & Security\Parking Assistance\Parking Sensors". The seller is "hawkdirect" and is located in London. This item can be shipped to all countries in Europe.